Commonly used as an ornamental tree is the European Beech ( Fagus sylvatica ). Beech trees are generally slow growing and do best in cooler climates. These are a impressive tree when given space to fully develop in broader landscapes, however they can also be used as hedging plants or they can be pleached. Young growth tends to be pyramidical with trees developing a classic rounded crown as they mature. Fagus sylvatica ‘Cuprea’ or Copper Beech is a fantastic shade tree with great colour. 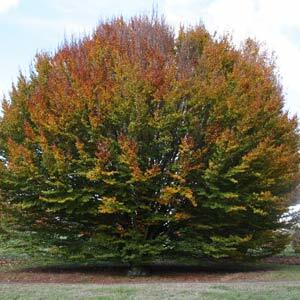 A number of Fagus sylvatica varieties are offered for sale in Australia ranging from the species Fagus sylvatica which is also known as the ‘Copper Beech’ which is a large tree at maturity, to smaller growing forms such as Fagus sylvatica ‘Pendula’ a weeping form to around 3m in height. Fagus sylvatica – Known as the Copper Beech, a tall stately tree to 20m over time..
Fagus sylvatica ‘Dwarf Form’ – Very slow growing spreading shrubby habit. F. sylvatica rotunduifolia – Also known as the ‘Round Leafed Beech. F. sylvatica ‘Purpurea’ – Dark purple foliage, slow growing to around 20m. This is a very attractive form that provides great contrast when planted amongst green foliage trees in large gardens and commercial plantings. F. sylvatica ‘Dawyck’ – Columnar or upright habit to around 4m, used as a narrow screen or focal point in the garden. F. ylvatica ‘Dawyck Gold’ – Lighter green foliage than above. F. sylvatica ‘Pendula’ – A weeping form with green foliage, usually grafted to around 3m. F. sylvatica ‘Pendula Purpurea’ – As above however with purple foliage. F. sylvatica ‘Tortuosa’ – Interesting form with twisted stems. The so called Southern or Antarctic Beech Nothfagus Moorie or the Evergreen Australian “Beech” with bright red new growth, large glossy leaves is one of the easiest species to grow.